Peaceful schooling fish that is suited for every community aquarium. The aquarium should be well planted because they need hiding places. 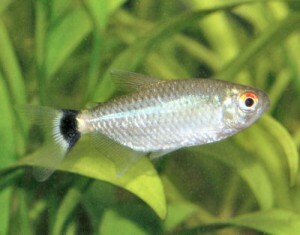 A dark substrate and a dimmed light by using floating plants bring out the colours of the fish.The fish is omnivorous. You should give them a great variety of live, dry and frozen food. Breeding is easy. The eggs are laid and fertilized between the roots of floating plants. After spawning the parents should be removed because they eat their own eggs. After 2 days the eggs hatch. When the young fishes are swimming free you can feed them with very fine infusoria. After a week you can give them Artemia-nauplii anf fine crushed dry food.